From the creator of “Weeds” comes a heartbreaking and hilarious new series set in a women’s prison. Based on Piper Kerman’s acclaimed memoir, “Orange Is the New Black” follows engaged Brooklynite Piper Chapman, whose wild past comes back to haunt her and results in her arrest and detention in a federal penitentiary. To pay her debt to society, Piper trades her comfortable New York life for an orange prison jumpsuit and finds unexpected conflict and camaraderie amidst an eccentric group of inmates. 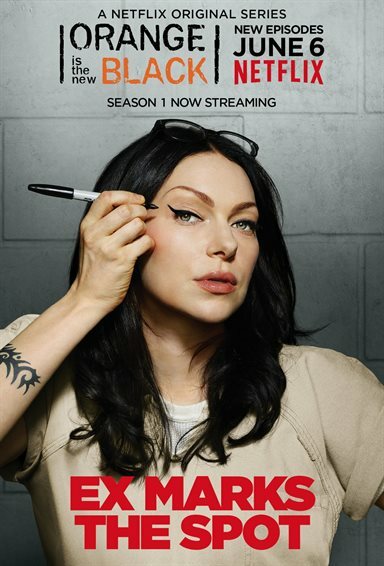 Download Orange Is The New Black in Digital HD from the iTunes store. Orange Is The New Black images are © Lionsgate. All Rights Reserved. In the past, there have been television shows about life in prison. That is nothing original. However, most of them focus on men in prison so when Orange is the New Black, which views life in a women's correctional facility, debuted on Netflix on July 11, 2013, it was somewhat groundbreaking. Not only was it different but it garnered critical acclaim at the time and enthralled audiences with its gritty and unique storylines. 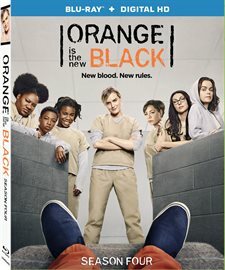 With Season 5 set to begin in this summer and Seasons 6 and 7 already announced, Netflix is releasing the complete Season 4 Blu-ray for purchase. For the uninitiated, Orange is the New Black follows Piper Chapman (Taylor Schilling; The Overnight) who lived a nice suburban life until she ended up in jail for aiding and abetting her drug smuggling former girlfriend, Alex Vause (Laura Prepon; That ‘70's Show). Sentenced to 18 months in a minimum-security prison, Piper was not ready for her new life, especially when she found out Alex was in the same jail. Their tumultuous relationship has played out over all four seasons and I'm sure it isn't over yet, especially because there are at least three more seasons coming. As we start Season 4, Alex murders one of her old boss's henchmen who was sent to kill her and a celebrity ends up in Litchfield correctional facility and is given special treatment much to the annoyance of the other inmates. We also see the changes being made by MCC management and the overcrowding and horrible conditions they brought with them. These new surroundings cause racial tensions that permeate the season and are the motivation for more than one fight and for Piper being beaten. Thirteen episodes later the season ends with a shocking death and what appears to be a small prison riot. Netflix does a terrific job with the production of this show and it pays off. While I've never been to jail, I can only imagine it somewhat resembles what we see onscreen. This helps the audience get a feel for what these women are dealing with and adds to the tension that simmers throughout the series. Like so many Netflix shows, the production value is high and sets the tone for this award winning show. There are also several high-profile directors on the show, including Andrew McCarthy (The Blacklist) and Jodie Foster (Little Man Tate). Shilling and Prepon lead an all-star cast that works. These actors take the words they are given and breathe a life into them that can send chills down your spine. Their inflections and delivery are well thought out and deliberate and each member of the cast adds a nuanced layer to the whole show. I think the show would have a very different feel had other actors been cast. The Blu-ray specifications include 1080p high definition 16x9 widescreen (aspect ratio 1.78:1) video. This allows the viewer to see every gritty detail on the set while enjoying the vast array of color hues. Deep tones are true and bright colors pop off the screen. The DTS-HD Master audio 5.1 is exactly what you would expect and the dialogue can be heard beautifully. Each disc on the three-disc set offers a different extra, which includes a gag reel, commentaries, and Visitation: Set tour with the production designers. All the extras offer some nice details but I particularly enjoyed the 10-minute set tour that showed off details the audience might otherwise miss. There is a reason Netflix has renewed Orange is the New Black for three more seasons and I'm sure fans of the show couldn't be happier. I'm sure there is still more to exploration to be done of Piper and Alex's relationship and I can only imagine the changes being made by MCC and how they will impact all of the inmates. I will also be interesting to see how much further the writers take the death plotline from last season (if they do at all). I'm looking forward to Season 5, which premieres on June 9, 2017.